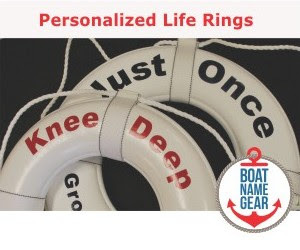 By Carolyn Shearlock, author of The Boat Galley, with over 500 FREE articles to get the most out of your boat kitchen with galley tips, insights & equipment recommendations. A few recipes, too - plus an active Facebook community to ask questions and share tips with other readers! 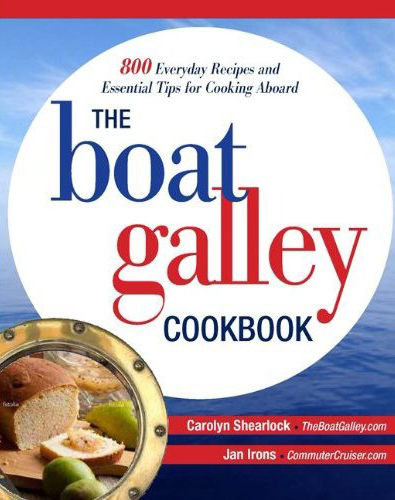 The Boat Galley Cookbook, written with Jan Irons, is now available at Amazon and other retailers. A while back, I wrote a post on The Boat Galley about galley design and things to look for, one of my points was a design where the cook couldn't get tossed across the boat in rough conditions. Both the friend's boat that I was on for my first offshore passage and Que Tal had a West Marine galley strap. The photo isn't great, but these were basically about 3 feet long with a snap on either end. Most of the length was a pad about 6 inches wide and the length could be adjusted. 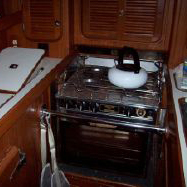 Both boats had pad eyes on either side of the stove so that you could clip yourself directly in front of the stove (this photo, from a friend, shows just clipping the strap to the grab rail). After using one once, I quickly concluded that this was a horribly dangerous concept. Who wants to be held in place right in front of fire and pans of hot food? If a pan spilled, I couldn't jump out of the way - I was a sitting duck for burns! • It didn't help me in any other place in the galley - getting into lockers, standing at the counter or using the sink was still an invitation to be thrown across the boat if I couldn't wedge myself in. • It took both hands to clip myself in - it's hard enough to cook with just one hand while holding on with the other, but to have to use both hands for yourself made it even tougher when you needed to get something from another area of the galley. Obviously, no one else particularly liked this design as they are no longer sold (I've found some other articles also talking about how being held in front of the stove is a hazard). 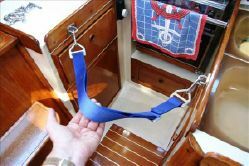 And that's where this article was going to end - basically that I didn't like the idea of a galley strap and thought that it was much better to simply have a galley design where you could wedge yourself in. • For an L-shaped galley, I really like this idea on the Catalina 34 Project pages. It's very similar to the one above, except that it goes diagonally from one corner to the other and allows the cook to move within the galley area. The poster, Dan Harrington, makes a point of noting how he deliberately kept the strap high - hitting the small of the cook's back - and I think that's a good way to avoid the "falling over the strap" problem. • For a long galley, I think you could create a strap running the full length of it if you keep it high enough and taut enough. Those long galleys have great counter space, but often lack places where you just can brace yourself. A long strap would allow the cook to move sideways to avoid a hot spill - maybe not the most instinctive move, but better than not being able to move at all. Such an arrangement would also allow the cook to be restrained when getting into the lockers, at the counter (although I like to sit to chop or slice if it's not smooth) and at the sink. I also found a couple of posts about designing and installing stainless bars as a gate to "close off" the galley area on a Saga 43, but no photos. That could be another option for a really wide-open galley. My conclusion: I still think that the galley straps that hold a cook right in front of the stove are both dangerous (when there's something on the stove) and useless when doing anything else in the galley. But now I'm willing to concede that there are numerous other galley strap configurations that are useful. I continue to prefer a galley design that allows the cook to wedge themselves in but even in those circumstances, a strap across the opening can provide an extra measure of security. 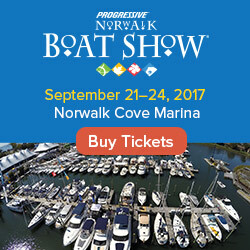 Carolyn Shearlock is author of The Boat Galley, with over 500 FREE articles to get the most out of your boat kitchen with galley tips, insights & equipment recommendations. A few recipes, too - plus an active Facebook community to ask questions and share tips with other readers! The Boat Galley Cookbook, written with Jan Irons, is now available from Amazon and other retailers.